Absolutely. I read daily. I don’t think you can be a successful writer if you don’t, because knowledge of both craft and genre is so vital to your success. Science Fiction and Fantasy, pretty clearly based on what I write. However, I do read political-military thrillers, love stories, mysteries and assundry other books when I can squeeze them in. I do have very limited reading time due to some commitments I have regarding both editing and critiquing others’ work and also doing a regular series of author interviews about craft which require me to read their books. Robert Silverberg, Mike Resnick, Timothy Zahn, WEB Griffin, Nicholas Sparks, AC Crispin, Kat Richardson…I’ll stop there or this list could really take up the whole word count for the interview. These are writers whose craft, style, etc. has inspired me and whose characters and plots touch me again and again. They are those whom I most try to emulate as I write. And whose careers I most aspire to duplicate to some degree. That’s like asking when I decided I wanted to breathe. I was compelled to write as soon as I figured out how to hold that giant pencil on my shoulder and write without tearing the thin paper at school with those floating wood chips in it. I haven’t stopped since. Eight, including two half-finished manuscripts (which probably shouldn’t count). Four are published plus an anthology I edited and various short stories. Life experience, hands down. And reading. My diverse experience in travelling, working, and cultures has hugely informed my ability to understand people, write characters, write plots, explore worlds, etc. And part of that is inspiration from seeing how others approach things, not just craft-wise, but in going directions I’d never have thought of. I figure out where I want to start, some idea of a few key turning points in the plot, and then I sit down and try and find the voice and write. The only research I might do is stuff needed for world building. I do most of that after though, trying to get characters and plot down first, but my latest work in progress involves a bit of time travel and uses some real Earth locations which required research to describe accurately, for example. What made you choose the genres of science fiction and fantasy? They have long been passions of mine. Within that, I mix in thriller elements and mystery elements and political and romantic elements, etc. But my usual base is SFF because that’s what I have enjoyed the most in reading, movies, etc. as a consumer. Latest book scheduled for release is The Returning (Saga of Davi Rhii Part 2) which comes out in June from Diminished Media Group. It’s a continuation of The Worker Prince, which got Honorable Mention on B&N Book Club’s Year’s Best SF Releases for 2011. Basically, Davi and his friends fought for freedom the first time. In book 2, now that they have freedom, they find it’s not as great as imagined, especially when those opposed to their new status send assassins to kill off their fellow citizens. On top of that, Davi and Tela are struggling to keep their relationship strong despite all their constant apartness from military duty, and people whose roles have changed as a result of the previous book’s events are trying to adjust to their new lives. Whereas the first book was more of a coming of age story about Davi, this book is more of a Bourne-like thriller, with relentless pacing, lots of action, and many crisscrossing storylines. There’s more political and personal scheming from the usual characters and more, plus Davi and his friends are being hunted and finding their lives on the line throughout. I leave a broken pencil under my pillow and the idea fairy comes in the middle of the night to exchange it for an idea. They come from everywhere—movies, tv, other books, short stories, news, newspapers, real life, etc. My best writing time is 8 a.m. to 1 p.m. and usually a brief window 7-10 at night. I usually get up, check my social media and email, send whatever promotional tweets and emails need to be done, then write until I hit my word count. And if I get stuck on one thing, I’ll write on something else. I try and focus on my priority project but sometimes I can’t. I may do a blog post to stimulate the juices and try again or I may work on a short story or something else. If I wrote only when inspired, I’d still be a wannabe. You have to discipline yourself. It’s like a job. You can’t just go in when you feel like it if you want to stay employed. Do you like the promotional aspect of being a writer? What are your best promotional tools? Well, I don’t like talking about myself but I do like talking about my work, and so I’ve learned to know the difference and focus on it. I am skilled with social media, people tell me, and I did get national attention for my debut novel from my social media efforts in large part. I also have established myself via my Science Fiction and Fantasy Writer’s Chat twitter chat show and blog interview series. People knew my name long before the book came out and now it sticks in their minds more. I started building that platform years before I had a novel ready or sold. You have to. Since I seem to be good at it, I can’t say I dislike it. It’s work sometimes, but once you learn what works and build a good routine, it’s not as hard as some people make it out to be. You have to set appropriate limits and accept what you can do, forget what you can’t. Twitter and my blog/blogging are my best tools closely followed by personal appearances on panels and at signings/readings. Those things seem to get the most and best results by far. How did you study the craft of writing? Did you read books on the craft of writing? If so, what are your favorites and why? Well, I studied by observation first, from years of reading. Then I had already done film school and spent years seeking the screenwriting dream. I also had written a lot of nonfiction, from journalism to essays as well as blogging. Beyond that, when I switched from screenwriting to fiction, after several years’ between, I did read good craft books. Everything from author interviews to Writer’s Digest books to Stephen King’s On Writing. AS far as the best go, On Writing is tops, so is 10% Solution by Ken Rand. Additionally, the Writer’s Digest series Elements Of Fiction Writing has been great. For science fiction, Orson Scott Card’s book on How To Write Science Fiction and Fantasy is pretty fantastic. Pantser when it comes to general approach, outliner when it comes to the process in that I outline a few scenes or chapters ahead as I go, usually, just so I can know how it’s fitting together and what I’m aiming towards. With sequels, I do tend to outline a bit more because the plot elements have to all be tied together and thought through. How did you get your first book published? How long did it take? Was this the first book you had written? I got it published by sending query letters to agents and publishers and submitting when asked, which was rare, and a lot of frustrating waiting. Finally, some small presses were interested and I was able to negotiate the best deal and here we are. 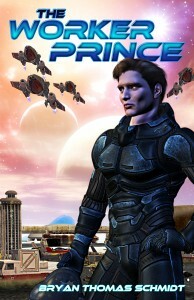 The Worker Prince was my second novel. It took me 4 months for first draft, then several months of revisions and querying. Then really it was 2 years from the finishing of the first draft until I signed the contract and another 10 months until the book appeared. Concert pianists rehearse daily, even at the heights of their success, why shouldn’t you? You want to be a writer, write. Don’t sit around thinking about it and talking about it. Do it. Practice. Everyone writes crap, even a Grand Master like Robert Silverberg still has pages he tosses. But if you don’t practice and keep the muscles in shape, you won’t get anywhere at all. So write. Bryan Thomas Schmidt is the author of the space opera novels The Worker Prince and editor of the anthology Space Battles: Full-Throttle Space Tales #6 He can be found online as @BryanThomasS on Twitter or via www.bryanthomasschmidt.net. Excellent interview; good information and encouragement for aspiring and new writers. This entry was posted on April 23, 2012 by P. Creeden in Author Interviews and tagged Byan Thomas Schmidt, Fantasy, science fiction.